An architectural acoustician by day, Anthony ‘Shimby’ McCreery records shows at the Empty Bottle and shares them on Bandcamp. 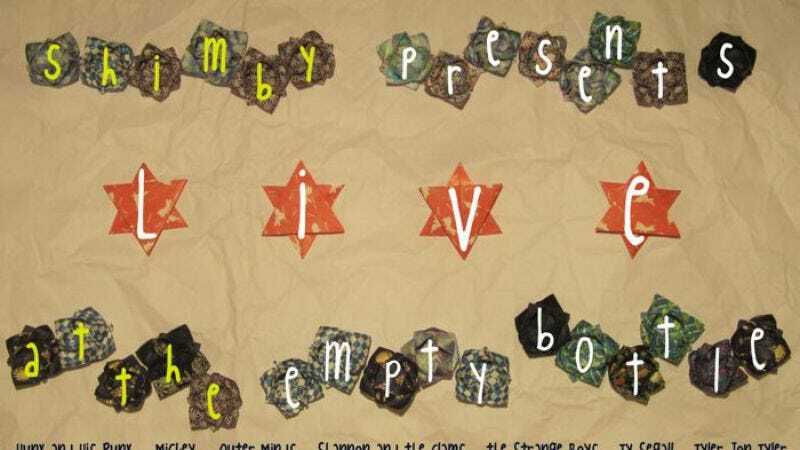 The best performances are now showcased on Shimby Presents: Live At The Empty Bottle, a 14-track compilation featuring Best Coast, Black Lips, and Ty Segall, amongst many others. Before Shimby’s May 24 triple bill release show featuring locals Mark Sultan, Magic Milk, and comp participants Outer Minds at—where else?—the Empty Bottle, McCreery spoke to The A.V. Club about the compilation, its artwork, and the mystical qualities of garage rock. The A.V. Club: How did you end up recording shows specifically at the Empty Bottle? Anthony ‘Shimby’ McCreery: I’ve been recording, on and off, and playing music with my friends and privately for 10 years or so. When I would go into the city to see shows—I was formally in a band called Bird Talk—the Empty Bottle would be the best place to play or see a show. So, basically, this kind of came up after I was in that band. We broke up, and I was itchin’ to do something musically. I had this recording gear sitting at home, and I thought, “Well, it’d be really easy to put it into the racks over at the Bottle,” and anytime I would be there, I could just record a show with this equipment I had sitting at home. I talked to Bruce, the owner, and Elliot, the guy who runs the sound installation, and they were cool with it. I didn’t get in their way, and I’m pretty incognito when I’m doing it, so they didn’t mind. Plus, it ends up being free promotion for them. AVC: At what point did you want to upload these shows to your Bandcamp page? Around the time I had 20 to 25 shows up on the site, it seemed like it made sense to coalesce them into something more than just links on the web. So I went through and somewhat randomly—I’ve listened to them all a lot, and there were certain things that kind of stuck out that I really enjoyed listening to. And those were the songs that ended up on the comp. It was just listening to the sets—being very familiar with them, and there were some songs that were just my favorites. AVC: How did you put together the sequencing for the compilation? ASM: Once I had the songs I wanted, I just started to play around with them in a playlist, just joshin’ ’em around and see that, “Well, this song ends on this kind of vibe, what would work next?” We’ve all made a playlist, so you kind of take the same instincts from the playlist and try to sequence it that way. It was a lot of fun to have crowd noise at the end of one song easily blend into the next one, and make it feel like a continuous show. AVC: How did you get the bands on the compilation? ASM: It was basically sending an e-mail to whoever was in charge of representing that band. Most of it was just [contacting] the band members. Some people had agents, and so I looked them up and contacted them. Then most of it after that was just a “yes” or a “no.” But to actually get that “yes” or “no” often took a really long time. Just because they’re touring musicians, they’re not checking their e-mail or Facebook—and I’m just some random guy. But once I was able to get their attention, and let them know that “Hey, you’re in the company of all these other bands, are you cool with this?” and then most of them were. AVC: You have some pretty big names on here, like Black Lips and Best Coast. AVC: Can you tell us more about the artwork? ASM: The artwork was just me and my wife sitting around wondering what was going to be the art on this thing. She had broken her heel sometime in January. She broke her heel jumping over this fence—that’s another story. [Laughs.] She was out sitting around on the couch watching a lot of television for some weeks, and got to doing all of this origami. She was making these little lotus flowers, and we were trying to come up with some kind of artwork thing, and so we decided to figure out to incorporate these lotus flowers into the artwork. Eventually, I just decided to co-opt the Chicago flag—which, from a graphic design perspective, is an awesome flag—just to put our own spin on it. So we set these flowers out on this crumbled paper in our kitchen and took a picture. AVC: Most of the bands on this compilation are garage rock bands. What about this music appeals to you, and why do you document it in the way you do? ASM: It’s so much fun to see live. It’s ironic that I’m choosing to record it. [Laughs.] Being a recording engineer, it gives me a fun chance to take their stuff and hopefully make it sound as good as, or better than, their studio albums. Because it has that live energy, but you still have to mix it properly. There’s something else going on there besides musical professionalism. The goal was really to get it on vinyl, in terms of the aesthetic presentation. I feel that this music is served best on a record. That I feel very happy to have accomplished. Because it’s one thing to have it online, you know? To make it real in the real world was much more challenging. AVC: Where does the nickname Shimby come from? ASM: My mom is Brazilian, [and] my dad’s American. So, I have a ton of family down there [in Brazil]. Right before I was born, they were throwing around, you know, “What’s my name going to be.” And there’s a word in Portuguese for “little one,” and it’s [phonetically] “be-chim.” Say that over and over again—“be-chim, be-chim-by, chimby, shimby”—that’s where my name came from. So it’s total gibberish. [Laughs.] My legal name is Anthony, but I’ve always been Shimby. I don’t think any other name would fit at this point.